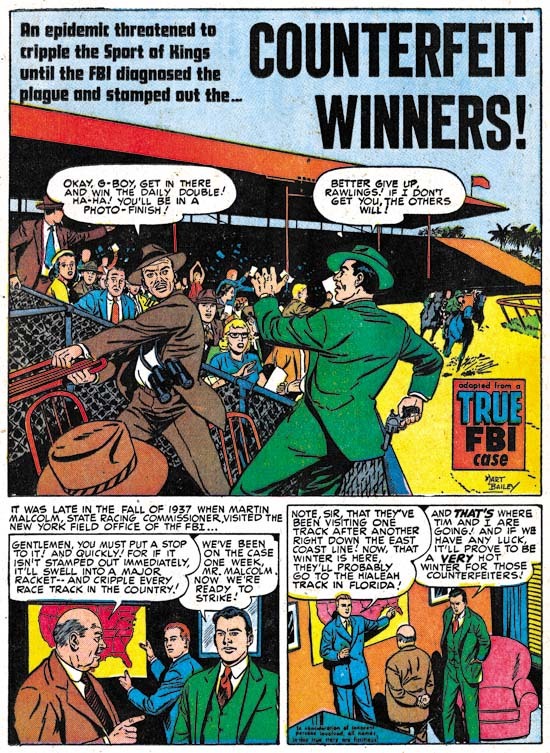 This chapter will continue the coverage of the Prize crime comics from the period December 1949 through February 1951. In the last chapter I discussed the work of Jack Kirby and Marvin Stein; this post will be concerned with some of the other artists. While most artists associated with Simon and Kirby productions were no longer found in the Prize crime titles there are a couple of glaring exceptions. Probably the most significant artist to jointly work the crime and S&K titles was Mort Meskin. At this point Meskin had become the second most used artist for Simon and Kirby productions (Jack Kirby retained the first place position although that would not always be true in the future). Even though Kirby’s presence in Headline and Justice Traps the Guilty had greatly diminished, Mort still did not achieve the status of primary artist in those titles; he never provided a cover nor did he ever do any lead story. Still he became a frequent contributor appearing in most crime comics and sometimes showed up twice in a single issue. 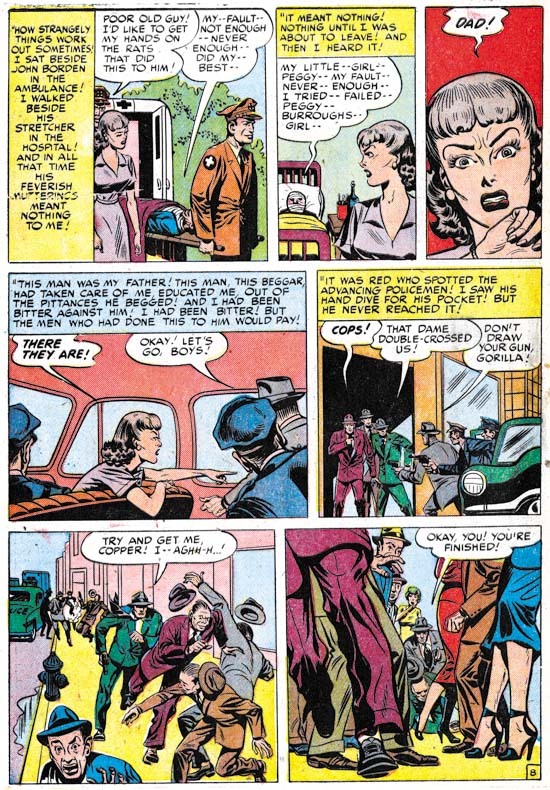 The crime titles provided Meskin with more opportunities for the depiction of action then the romance art that dominated his work for Simon and Kirby. Not that the diminished use of violence hindered Mort for those occasions when he was to draw it. However Meskin’s Prize comic work had greater similarities to his romance work then it did to the hero genre stories he had previously done such as the Vigilante. John Severin also did art for both the crime and romance titles during this period. John is probably best known for his western and war genre comic book work. He may not have done that much crime stories for Prize, but they are very well done (I wish I could say the same thing about his S&K romance art). 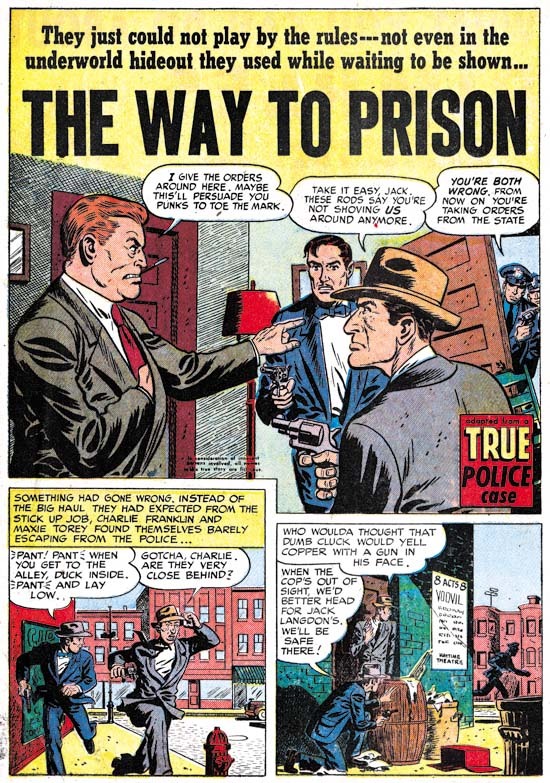 Not a criticism against Severin, because the same thing can be found in much of the crime comics from the 50’s, but note how well dressed the stick-up criminals are! George Gregg is not in the same category as Meskin or Severin. While he previously had provided some work for the Simon and Kirby romance titles during the period covered in this chapter that was no longer the case but he would supply a small number of stories for the crime titles. “Jewels of Death” is not most typical of Gregg’s work but I still think that is the correct attribution. But what a great splash! Gregg’s females generally are rather stiff but not this native beauty. While the Prize crime titles are really pretty tame stuff by this time, they still could be quite suggestive (“we have ways of inspiring speech”). I have discussed Mart Bailey previously in Prize Comics Western, a Rough History. For about a year and a half he was the primary artist for that western title. He was originally brought in to draw the movie adaptations that PCW featured when they switched to photographic covers. He remained the principal artist until the photographic covers were dropped at which point John Severin became the principal artist for the title. However Bailey continued to provide backup stories. Mart was not as important an artist in the crime titles but he did draw a number of backup stories but he never provided any art for any Simon and Kirby production. Bailey drew in a realistic style which was probably why he was used for the movie adaptations in PCW. While his art is technically fine it is a bit dry for my tastes. There are a number of artists appearing in Headline and Justice Traps the Guilty during this period that I have not been able to identify. Frankly in most cases it is not a big loss as their art work is really not that great. 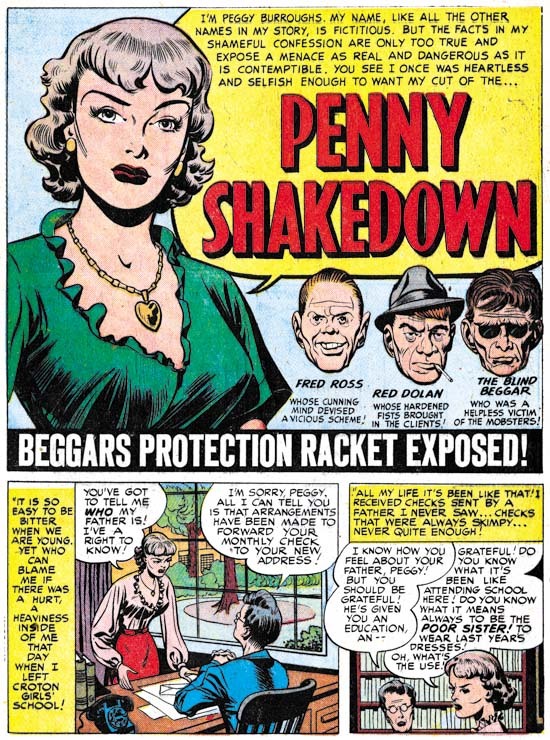 However there is one story, “Penny Shakedown”, that I wish I could provide an attribution. This story is certainly one of the best from the Prize crime titles during this period. Note how in the splash panel the woman is speaking to the reader, Simon and Kirby often used this type of confessional splash design. This story is so good that I once suspected that Kirby supplied layouts. However the “cinematic” approach is not quite the same as Kirby’s. For instance in one panel the artist uses a very low viewing angle of a crowded sidewalk where the foreground consists of mostly legs and the arrest of a criminal is almost lost in the background. Not the sort of thing Jack would do. This period, from October 1949 until January 1951, is the one that I am most uncertain about. 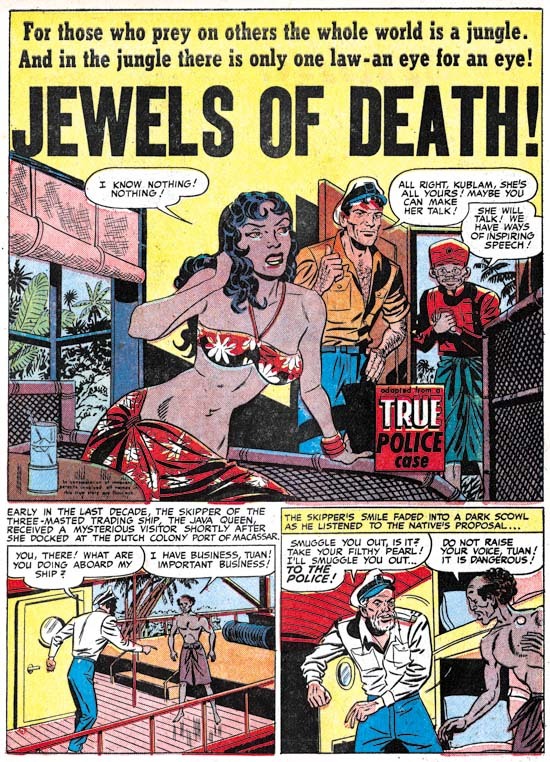 It is clear that previously Simon and Kirby produced the Prize crime comics; basically the same artists were used in both the crime and romance titles. During this period, however, only a few artists worked both genres. Kirby did some cover art and probably provided a layout for one story. Both Mort Meskin and John Severin drew stories for both crime and romance. On the other hand, Mart Bailey was a significant presence in the crime titles and Prize Comics Western but never did any romance stories for Joe and Jack. At this time the first story of both Young Romance and Young Love always had a “produced by Simon and Kirby” credit but that cartouche never appeared in Headline or Justice Traps the Guilty. This despite Simon and Kirby’s long history of self promotion. While it may never be possible to say with certainty, in my opinion Joe and Jack were no longer producing the Prize crime titles during this period. Whatever the reason for the changes in Headline and Justice Traps the Guilty, is was not due to poor sales. While I have no figures on the number of copies sold there are clear indications Prize was still making good money on these two titles. Why else would Justice Trap the Guilty go from a bimonthly to a monthly publication schedule with issue #18 (September 1950)? While Headline would never become a monthly, JTTG remained one until September 1955. I think John Severin’s work here was inked by another artist. I have not seen him do any solo inking until later in his run at EC and even then his own inking style was more thinlined than this. The most probable suspect for this story would be Bill Elder who always had a great way of solidifying Severin’s work. Later in the fifties when he was doing American Eagle for Prize Comics Western, he had an assistant or at least in later stories he was replaced by an artist working in a style obviously based on his own. John Benson’s recent Squa Tront about John Severin has all the information. I’ve begun to wonder if the shift away from Meskin’s earlier “hero” style which you mention and towards his S&K style wasn’t a result of Mort trying to conform to what he perceived as a house style. His style changes once again when he goes back to DC in the 50s. It’s shame he never did any covers. I am certain you are correct that Severin was inked by another. Unfortunately I have not studied the material close enough to be comfortable at assigning inkers when the work is unsigned. When signatures are present the most common one is Bill Elder. This crime stories looks so much like Severin’s Prize Comics Western work that I would hardly be surpised if Elder was in fact the inker. John Belfi was also used, though perhaps not at this date. However there is one story in PCW from about this time that was inked by Kurtzman. So until I do a closer examination of the inking styles, I will continue to only assign inking credits when the work is sign. There certainly was a S&K house style and I have little doubt that Meskin provided work that he thought would be received well by Joe and Jack. However Jack would provide more action in his crime stories then Mort did. But since Mort was starting to provide art for the crime titles at the point where Jack stopped, perhaps he never realized that Kirby handled crime a little different from romance. When I was studying the Severin story I was thinking the same as Ger, the work does look like Elder’s style. The art in Penny Shakedown looked very familiar to me and I was trying to decipher who it might be. 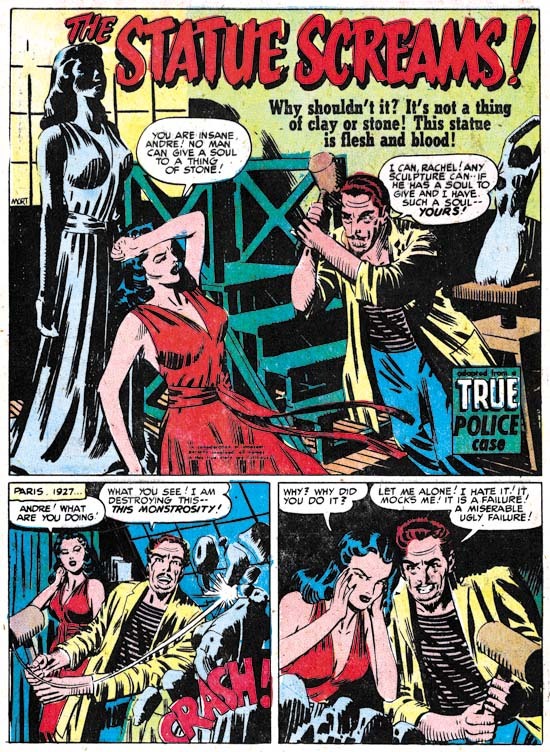 The woman’s face in the splash (which looks like Kirby may have laid out, unless the artist was swiping from an earlier Kirby splash)and parts of the page reproduced have similarities to Johnny Craig’s work. In looking over Craig’s credits, he occasionally drew for other companies in 1948-50, although he was pretty busy at EC, so its a possibility. Harry, I agree with Nick and Ger that it is likely Elder inked the Severin story. I would not rule out Kirby layouts for the splash, although because of the non-Kirby like aspects of some of the story art I do not feel Jack laid that out. I really am not that familiar with EC artists so I had to look up what type of work Johnny Craig did. I can see where you are coming from but while I like the artist for Penny Shakedown he does not seem to be as good an artist as Craig.